I've included here a painting I completed a month after arriving back in New Zealand after five months of travelling around USA, Europe and Hong Kong. The painting is called 'Travel Fund' (1000mm x 800mm) and is based on a painting by Jean-Baptiste-Simeon Chardin called 'Le Singe Peintre' (The Monkey Painter, executed around 1740). The image on the left is photographed from the original painting in The Louvre, in Paris. (frame included). My version comments on my want to raise more funds to travel again, so in turn becoming a painting monkey, gathering those funds (if only it was as easy as painting!) - a means to an end. 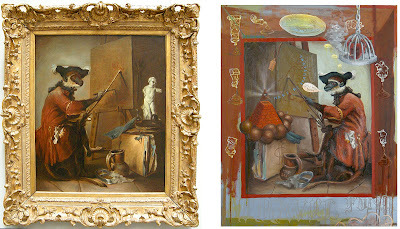 The other reason for using the Chardin was to update the parody of the 'monkey' paintings (I believe he painted several versions in different settings and vocations) and look at it in contemporary terms of visual engagement outside of New Zealand's artistic culture, looking at Western influence and to resist becoming, as Philip Guston puts it in the introduction to his 1978 Minnesota lecture, a painting monkey.